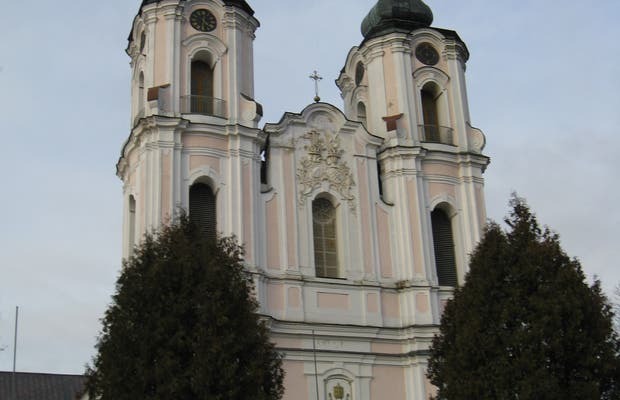 The Basilica of the Visitation of the Virgin Mary is located in the town of Sejny, in northwestern Poland, near its border with Lithuania and Belarus and very close to Suwałki. The Basilica was built between 1610 and 1619 in the late Renaissance style by the Dominicans who came from Vilnius, next to it was built a monastery. In 1760 it was rebuilt giving it a Lithuanian baroque style and in 1818 it was elevated to the dignity of cathedral of the Diocese of Augustow. The Diocese was abolished and divided following the constitution of the Republic of Lithuania and the Republic of Poland in 1925. Cardenal Karol Wojtyla, the future Pope John Paul II, and Stefan Wyszynskiy, in 1973, crowned the statue of the Virgin Mary In 1973 he was crowned the statue of the Virgin Mary and it was elevated to dignity of minor basilica.